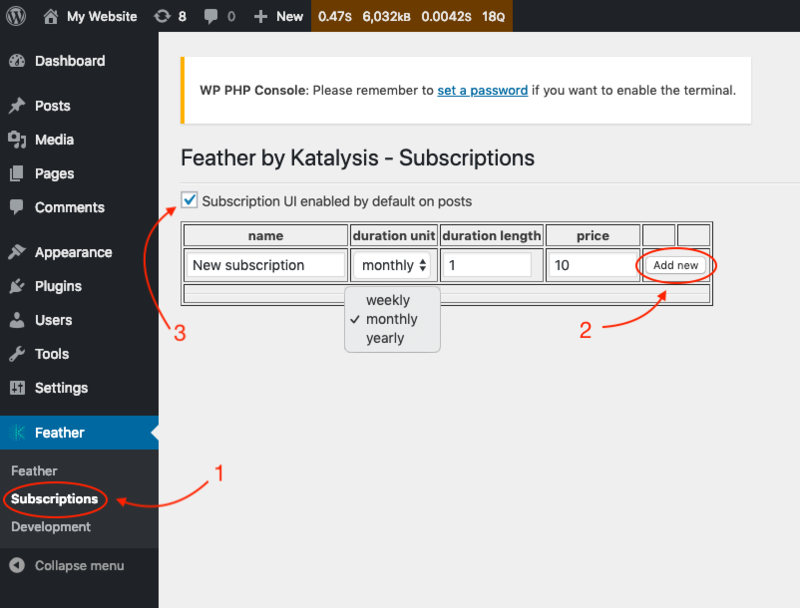 To set up or edit your subscription options for readers, go to your WordPress admin dashboard and then to our plugin Feather. Here, click "Subscriptions" underneath (step 1 in picture blow). a. Fill in the name of the subscription (e.g. "1 Month"). b. Select your duration unit; this can be on a weekly, monthly or yearly basis. c. Specify the length of the certain unit. For instance duration unit "weekly" with duration length "1" means you're selling the subscription for 1 week. A duration unit with "monthly" and duration length "6" means the subscription will last for a period of 6 months. d. Determine your price (€). The price you need to fill out is for the total duration of the subscription. If you sell a subscription for the duration of 6 months and the price per month of your subscription is €3,50, you should fill out the total, thus 6*€3,50 = €21. By pressing "Add new" (see step 2 in picture below), you have now made a subscription option available for your readers. 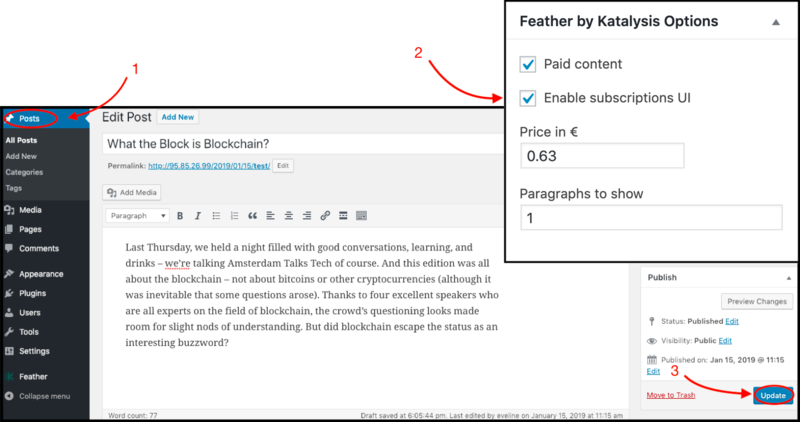 By ticking the box (see step 3 in picture above), you can also choose to show Subscriptions as a payment option to your readers by default on all published articles. This will show up in the reader's wallet. 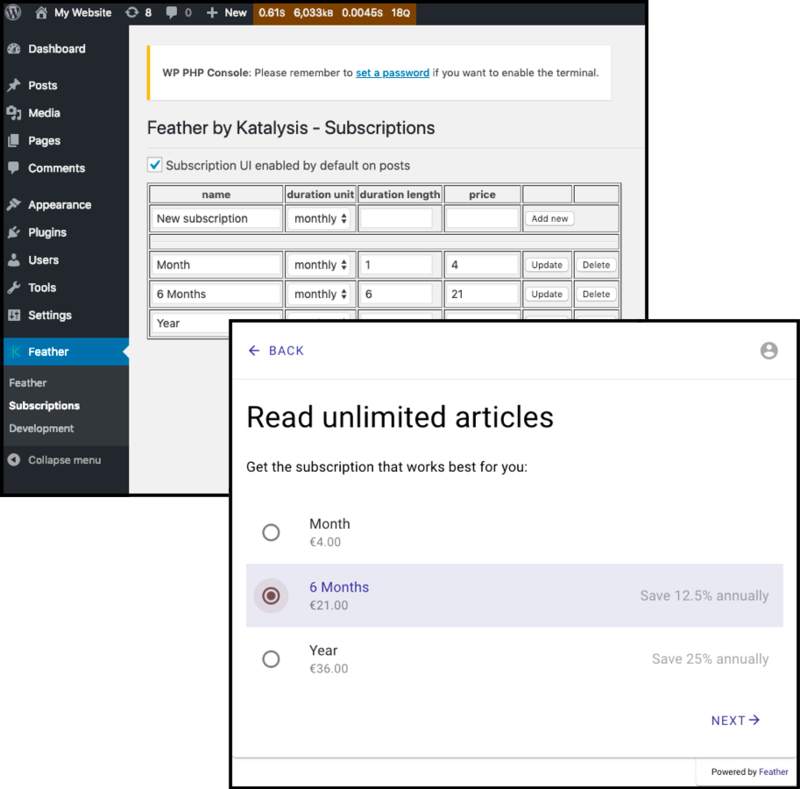 If you do not want to show Subscriptions by default, you can choose which articles can show the option to Subscribe specifically. To do this, go to "Posts" and select the article you want to show Subscriptions on (see step 1 in picture below). a. Tick the box "Enable subscriptions UI" on the right of the page (step 2). b. Update (or Publish) the article (step 3). When readers want to subscribe with their wallet, they can select their desired option. Feather also calculates how much they save annually with long-term options, and displays this to the reader as seen in the above picture. When you want to update or add a subscription option, please note that the updated or new option will only be available for those who wish to subscribe after you've updated or added it. Those who have already subscribed to your original option will still be charged the original price and maintain their subscribed status. When you want to delete a subscription option, please note that those who have already subscribed to that option will still be charged the original price and maintain their subscribed status. You can make an unlimited number of subscription plans available for your readers to purchase. PROTIP: optimise your subscription sales by designing your subscription plans the right way. Have a look at our blog post which explains this a bit more in detail. NOTE: does having recurring subscriptions available for readers interest you? This is will be a premium feature, and is coming soon.